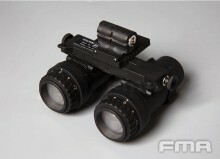 This FMA ANVIS 9 NVG Dummy Set is the highest quality NVG dummy you have! It doesn't have any function. It is the best choice for your special forces impression. Please note that this item is for airsoft dummy only. Click the button below to add the FMA ANVIS AVS 9 NVG Dummy (Black) to your wish list.